The best third party ship managers employ technology, good business practices, economies of scale and a customized approach for each client. None of that will succeed without first addressing the human element of the equation. Ship managers Crowley Maritime, Thome and Bibby Ship management companies all manage tonnage for others, in sometimes dissimilar sectors and different regions and world trades. Those differences set the three groups apart in terms of the skill sets necessary to manage different classes and types of ships. 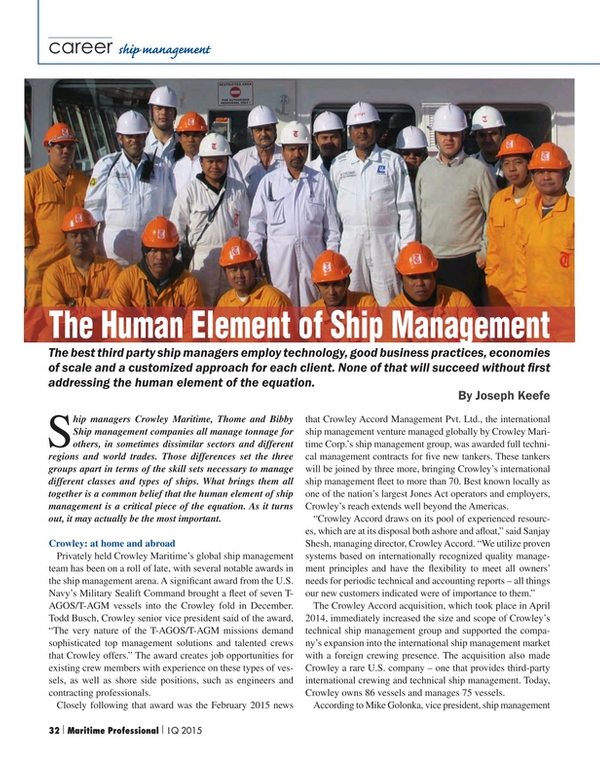 What brings them all together is a common belief that the human element of ship management is a critical piece of the equation. As it turns out, it may actually be the most important. Privately held Crowley Maritime’s global ship management team has been on a roll of late, with several notable awards in the ship management arena. A significant award from the U.S. Navy’s Military Sealift Command brought a fleet of seven T-AGOS/T-AGM vessels into the Crowley fold in December. Todd Busch, Crowley senior vice president said of the award, “The very nature of the T-AGOS/T-AGM missions demand sophisticated top management solutions and talented crews that Crowley offers.” The award creates job opportunities for existing crew members with experience on these types of vessels, as well as shore side positions, such as engineers and contracting professionals. Closely following that award was the February 2015 news that Crowley Accord Management Pvt. Ltd., the international ship management venture managed globally by Crowley Maritime Corp.’s ship management group, was awarded full technical management contracts for five new tankers. These tankers will be joined by three more, bringing Crowley’s international ship management fleet to more than 70. Best known locally as one of the nation’s largest Jones Act operators and employers, Crowley’s reach extends well beyond the Americas. The Crowley Accord acquisition, which took place in April 2014, immediately increased the size and scope of Crowley’s technical ship management group and supported the company’s expansion into the international ship management market with a foreign crewing presence. The acquisition also made Crowley a rare U.S. company – one that provides third-party international crewing and technical ship management. Today, Crowley owns 86 vessels and manages 75 vessels. According to Mike Golonka, vice president, ship management for Crowley, at the top of the list for qualities that a ship owner should look for when shopping for a ship management company is the search for another ship owner. He adds, “The best ship management companies are usually those who also own and manage their own fleets.” Also on that list are transparent and open communications with principals and, of course, a safety-oriented manager who will not only help to keep employees and property safe, but will also help to reduce claims and costs. Touting Crowley’s 120 years of varied experience, Golonka offers that Crowley is able to bring expertise to many different areas of operations and sectors – a benefit few others can offer. To ensure efficiency with all of this in-house expertise, Crowley dedicates commercial managers and a specialized staff to each customer, therefore offering tailored ship management services across nearly any sector. The final piece of the process, says Golonka, involves establishing clearly understood, high-quality operating procedures leave little room for interpretation and higher levels of consistency from ship to ship. As a bonus, high-quality ship management attracts and can help keep the most talented mariners, which often translates into even lower claim costs and proper maintenance on the vessel. To that end, Thome’s Human Element drive is well recognized in industry and focuses on Quality and Safety; which Malik says go hand in hand. For example, Thome Group recently announced that it had become self-sufficient in recruiting junior officers, thanks to its in-house cadet training program. Launched in 2005 under Thome’s “Human Element” initiative, the Thome Global Cadet Program has already trained in excess of 1,350 cadets from at least 12 countries in Asia, Europe and the Far East. Currently there are 650 cadets at various stages of training on the program with another 200 due to join soon as deck, engine, electrical or catering cadets. The success of this scheme has enabled Thome Group to fill all of its 2014 junior officer vacancies from within its own pool of trained seafarers. As Thome Group continues with the expansion of its fleet, the requirement for suitably trained officers to serve onboard its tankers, bulkers, gas carriers and offshore has increased exponentially. The cadet program has a robust selection process to ensure that Thome recruits well rounded candidates who benefit from quality coaching. The multi-national and multi-cultural cadets match up well the diversity with Thome Group. UK-based Bibby Ship Management is seeing a near 20% increase in inquiries for its services from the offshore sector as ship owners and support vessel operators look to reduce costs and recruit the best crews for their vessels. But, those two seemingly dissimilar goals can be hard to achieve in the same fleet. Not so, says Bibby. Predictably, the trend towards lower costs is being fueled by oil majors as the slump in oil prices weighs on their bottom line. Can managers improve service and crew quality while reducing costs? Andrew Rodden, Bibby Ship Management’s UK Managing Director says that they can, explaining, “There is a calculable commercial advantage to be made and there is a partnership between owner and manager which can benefit and improve the overall quality of the service delivered to the oil company,” he said. The drive to improve cost efficiencies is not just limited to the North Sea offshore sector, other high cost operators are being pressured to cut costs while maintaining operating efficiency. That’s easier said than done. But Rodden says that Bibby has the answer. According to Bibby, the key benefit is the operational economies of scale that managers can offer, especially where there are owners with small numbers of vessels within a geographical region. They will have a shortage of options in terms of what economies of scale they can draw on to help them drive costs down, they cannot really cut their crewing costs nor can they drastically trim their travel expenditure or vessel procurement. “Bibby Ship Management’s strength lies in its door to door, end-to-end service which will add value to the supply chain. Any ship owner can go to any company in the Philippines to get a Filipino crew, but the reality is being able to offer the security of doing all of that in-house. We manage and control that process, and we can add value at each step of the way,” Rodden said. The decision to outsource ship management to a third party is typically a financially driven solution. And yet, a sub-standard manager can depreciate the assets, adding to the costs of outsourcing, and negating any advantage there. Often, the owner’s reputation relies on the manager’s performance, which eventually boils down to who is manning those vessels, where they came from, how they were recruited and trained. But, crew quality and financial savings need not be mutually exclusive concepts. This much, the world’s best ship managers can agree upon. Crowley, Thome and Bibby might operate in different sectors, global regions and employ different strategies when it comes to best practices when it comes to managing their far flung fleets. The one thing that they can agree on is the need for quality mariners, a structured recruiting process and continual vetting of these personnel. Without addressing the human element first, the rest is certain to fail.